The first attempt to subdivide city property into house lots seems to have been by Gear, Lansing & Co in 1898. AV Gear and Theodore Lansing formed Gear, Lansing and Co. They bought 260-acres from Paul Isenberg Sr that included the area bounded by Kapahulu Avenue, Waiʻalae Road, Ocean View Drive and the back of Diamond Head. At first, people seemed to ‘trickle’ into Kaimuki. Then, following the Chinatown fire in January 1900, many Chinese families and small businesses became homeless, and new homes were sought. Since I started these summary posts, I have received a variety of questions and comments (from many) asking about this or that. 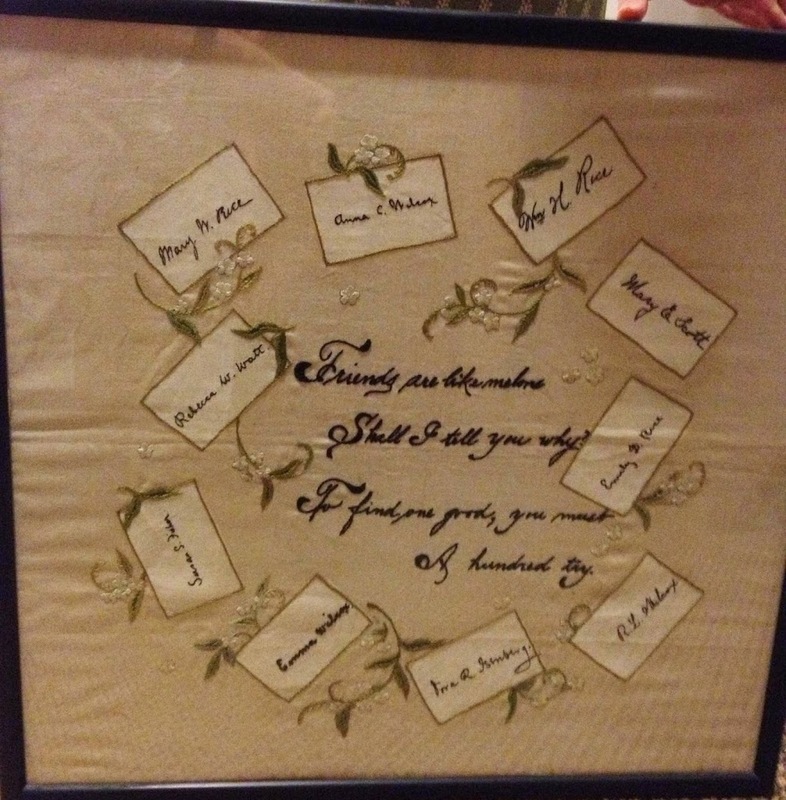 One such included a call from someone at Punahou School who had received the stitching noted in the image; someone saw it for sale in a store on the continent, bought it and gave it to Punahou. They felt there were Punahou ties. They asked me what I thought. Then, the names … who is listed, who put this together and why was it done? Some obvious Hawaiʻi ties come up – and lots of association back to Kauai with the likes of Rice, Wilcox and Isenberg … including their connections to Punahou. It is still an untold story. So, through this, hopefully more can be known of the Who, Why and When of the piece. Let us know what you know about this. It’s interesting … someone finds a piece of stitchery on the continent, sees connections to the Islands, but a mystery remains as to Who, Why and When …. (Mary Waterhouse (July 26, 1846-June 28, 1933;) married William Hyde Rice; Punahou 1861 and 1862) John Thomas Waterhouse Sr., father of Mary. (Mary Dorothea “Dora” Rice (1862-1949) Maria Rice, sister of William Hyde Rice married Paul Isenberg; Paul and Maria Isenberg had two children, Mary Dorothea Rice Isenberg and Daniel Paul Rice Isenberg (1866-1919). It’s ‘all in the family,’ kind of; and, it’s interesting how a piece of fabric can start to call attention to and remind us of stories about people and life in the Islands, especially on Kauai and at Punahou … but, there is still more to be known about the piece. I have already done some posts on some of the people noted here, and will be doing some more in the future. There is an obvious link to Punahou and Kauaʻi. Any help others can provide on Who, Why and When (or anything more) this was done is appreciated. The image shows the stitching. In addition, I have added other images in a folder of like name in the Photos section on my Facebook and Google+ pages. In 1887, Daniel Paul Rice Isenberg (Paulo Liʻiliʻi) (son of the Paul Isenberg, one of the founders of H. Hackfeld & Co. (Amfac) and one of the organizers of the Līhuʻe Sugar plantation) invested a large part of his inheritance in the development of a 3,000-acre ranch at Waiʻalae, Oʻahu. He obtained the major part of Kaimuki from the Lunalilo and Bishop estates, and used this land for cattle, alfalfa and race horses. He was the first ranchman in the islands to demonstrate the growth and uses of alfalfa, a valuable stock feed, but he couldn’t realize much of a profit because sugar and rice were top priority, then. His birthday was on June 11, Kamehameha Day, the day for horse races at Kapiʻolani, and “rarely did it pass without a luau at Waiʻalae Ranch.” King Kalākaua frequently visited Isenberg at his ranch for the evening, for both of them enjoyed the same things, festivities, luaus and singing. In 1919, after Isenberg’s death, the ranch’s lease was sold to accommodate a dairy by 1924; it was the largest dairy in Honolulu. Then, in 1927, the Territorial Hotel Co., as part of a promotional program to develop luxury travel trade to Hawaiʻi on the mother company’s Matson Navigation Co. cruise ships, built the Royal Hawaiian Hotel … and with it the Waiʻalae Golf Course. The hotel and golf course lands were leased from the Bernice Pauahi Bishop Estate. 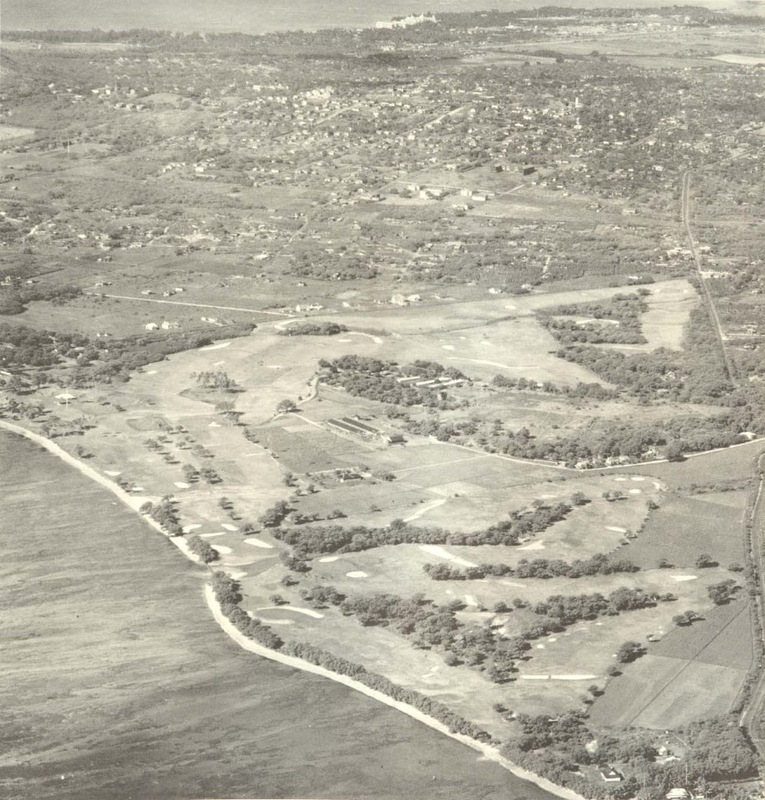 The Golf Course was opened for play on February 1, 1927. In July 1927, the Isenberg ranch home near the mouth of Wai‘alae stream became the club house for the Wai‘alae Golf Course. Local players were able to use the course, and by payment of annual fees for play became “privilege card holders” in the Territorial Hotel Company’s Waiʻalae Golf Club. In 1930, a group of these Waiʻalae players formed a private club within the Waiʻalae Golf Club which they called Waiʻalae Country Club. It enlarged a small service building close to the main clubhouse, installed showers and had its own clubhouse where the swimming pool is now located. The great depression of the 1930s severely reduced travel and resulted in bankruptcy of the Territorial Hotel Co. Matson took over the obligations and interests of the Territorial Hotel Co. which included the Royal Hawaiian Hotel, the Moana Hotel and Waiʻalae Golf Club. By the 1930s, the beachfront along Kahala Avenue was being developed with homes, while farming continued in other areas. In 1938, more than 50 pig farms were operating in the vicinity of Farmers Road and Kahala Avenues. Residents of the area, citing an increase in rats and mice at Kahala, petitioned the territorial board of health to remove the pig farms (Honolulu Advertiser, December 20, 1938). During these years, play on the course was mainly by local privilege card holders, most of whom were members of Waiʻalae Country Club. In August of 1941, fire destroyed the Waiʻalae Pavilion which was used by Waiʻalae Golf Club for dining and dancing, and Matson decided to turn the golf course and remaining buildings over to Waiʻalae Country Club. Before this plan was consummated, the US had entered World War II, the military had requisitioned the Royal Hawaiian Hotel, and numerous military defenses had been installed along Oʻahu’s coastline including the golf course at Waiʻalae. Waiʻalae Country Club was incorporated on September 30, 1942 and became lessee of the golf course acreage and a small section of land owned by Matson on which the old Isenberg home (later The Pavilion) had been located. The military built a replacement for the Pavilion because of the heavy use of the course by military personnel during the war. The old Waiʻalae Country Club clubhouse was destroyed by fire in 1952, but through the conversion of the military structure into kitchen and dining facilities, and the building of new locker rooms, Waiʻalae was again in full operation within twenty-four months after the fire. In the 1953 filming of “From Here to Eternity,” Private Prewitt is shot near the bunker on the first hole at Waiʻalae. Tennis courts, swimming pool and added parking units were completed in 1958 and Waiʻalae became a Country Club in fact, as well as, name. The image shows the Waiʻalae Golf Course in 1929. In addition, I have added other images in a folder of like kind in the Photos section on my Facebook and Google+ pages.